Please note that this product has been discontinued and replaced with the PFL series. 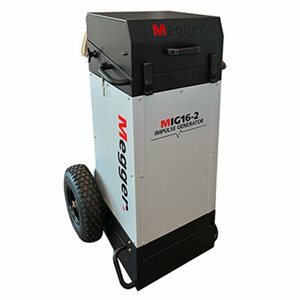 The Megger Impulse Generator (Thumper) MIG16-2 is designed to provide quick, effective, accurate and safe fault location, reducing system outages and customer minutes lost. The instrument comes in a rugged yet portable enclosure. Its IP64 rating makes it suitable for use in even environmentally hostile conditions. The MIG16-2 offers the facility to undertake cable testing, cable and fault diagnosis and pinpoint fault location using acoustic methods.